The stone in this ring is a Peach Zircon so let's have a word or two about the mineral Zircon and clear up any confusion. The Zircon is a natural gemstone with historic value and has been used in jewelry for thousands of years. Don't make the mistake of confusing it with the cheap, man made cubic zirconia. These are two entirely different things! You will find real Zircons in a variety of vibrant colors in your high end jewelry stores, sparkling away in expensive jewelry. 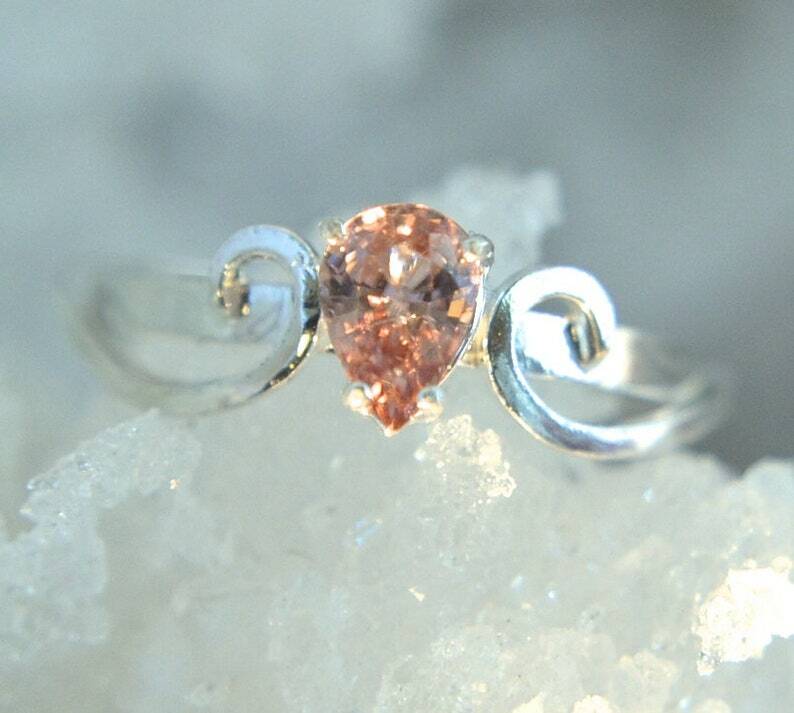 Zircon comes closer to resembling Diamond than any other natural gem. It has a strong luster and intense fire that compares to the Diamond. The hardness is a 7.5 on the Mohs scale so it is fit for everyday wear. I'm thrilled to have this one for you! It is a pink to peach depending on the light and sparkles like crazy. It is a 7x5mm pear cut and .85 carats. The sterling silver band was handmade by me. I started with a 2mm wide strip of silver then built up gentle curls that flow from the palm side of the ring. The curls hug the stone from either side and put all the focus back on that sparkling Zircon. Life is too short to wear ordinary jewelry!